Alex Kiefer and Jacob vanDerRoovaart won the 2015 Student Design Competition. 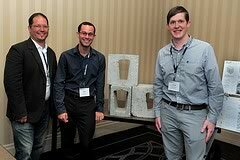 Cal Poly State University students Alex Kiefer and Jacob vanDerRoovaart won the 2015 Student Unit Design Competition with their innovative “FlipBlock” during the National Concrete Masonry Association’s (NCMA’s) Midyear Meeting, August 19 in Montreal. In this annual NCMA Foundation-sponsored competition, architectural students are challenged with designing a “new” concrete masonry or hardscape unit that can be produced on a block machine or big-board machine. Seven schools participated in the program this year with the top three presenting their block shapes at the Midyear Meeting. In addition to Cal Poly State University, Iowa State University students were awarded second prize and North Carolina State University received third prize. Click here for more photos of the award winners and participants. To learn more about the annual Student Unit Design Competition, visit the NCMA’s website. Amerimix®, a manufacturer of preblended mortar, grout and stucco mixes, has unveiled its new water repellent masonry mortar: Amerimix Water Repellent Mortar (WRM) with RainBloc GP®. The National Concrete Masonry Association (NCMA), along with Interlocking Concrete Pavement Institute, is now accepting entries for the Concrete Masonry Design Awards of Excellence program. The guide is a compendium of contemporary knowledge collected over several decades that highlight practical, field-proven solutions using segmental retaining walls (SRWs).